Xerokampos “dry plain”( it got its name due to the fact that the area had been a dry place for many years.) However, now the plain of Xerokampos is a gorgeous and lush green area in the very eastern part of Crete. The settlement of Xerokampos is built among olive trees, in a magnificent natural landscape surrounded by fantastic organized or non-organized sandy beaches and crystal –clear sea. The area is also ideal for those who love the beach as well as those who love to explore the seabed. The seabed is a real marine paradise. Anyone who likes walking should definitely go up to the top of one of the many nearby hills. Up there you will feel the magic of the view and you will forget about everything! 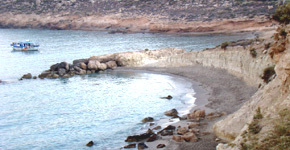 Don’t forget that Xerokampos is the starting point for excursions to the sights of the whole Eastern Crete.